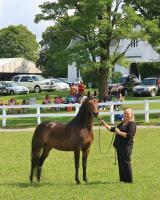 The UVM Morgan Horse Farm is situated on 215 acres in the lush, agricultural area of Addison County. 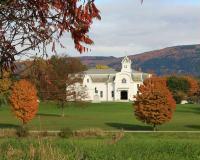 Colonel Joseph Battell built the main barn in 1878 to house his assembly of the era's finest Morgans. In 1906, Battell gave his farm and Morgans to the United States government. From 1907 to 1951, the federal government bred, trained, and exhibited many of the breed's greats. The term ''Government Morgan'' is in reference to the tremendous impact of Weybridge-bred horses from that period. In 1951, 25 head of Morgans and the government property were turned over to UVM. 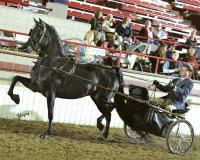 The goals of the UVM Morgan Horse Farm are to perpetuate and improve the Morgan breed, to provide educational training and experience for students and the general public interested in equine science, to function as a public relations arm for the University, and to provide a resource for research in equine science. Today's herd of 60-80 horses maintains a genetic link to General Gates - the foundation sire of Battell and the Government program. UVM Morgans have a reputation for superior quality on a local and international basis.